We are working to create a world where children become educated, healthy adults who are involved in their communities and share their love of Jesus Christ. In order to affect this long-term result, we have chosen to make every decision with the best interest of the children in mind. Children are given access to education of many different kinds. 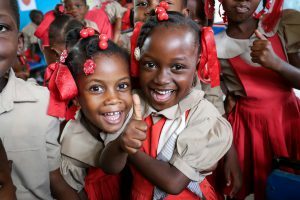 Pre-school, elementary, high school and in some special cases university level schooling is made available to those in our projects. With knowledge, the child can grow into an adult that makes informed reasoned decisions helping themselves, their families and communities. Wellness is an integral part of our work. Children who feel good, learn better and play harder! Wellness speaks to physical health, emotional health and living in a clean environment. We teach health in our schools and work with caregivers to improve their care for children with special needs. Children are being taught to be involved in their communities and engaged in family life. Good interpersonal relationships and good citizenship go hand in hand. Learning to be involved with others is central to creating a society that functions well. Christ taught that as we go about our work, we are to make disciples. Faith forms an important part of each of our lives. Therefore, the Christian message is included in most of our projects. Some projects are openly sharing the gospel, while in others we are showing the gospel through and how we conduct ourselves in daily situations and by caring. As we carry out our various projects, our staff is always ready to explain that we are doing this in Jesus name and because we want the very best for them. So, you do not need to reinvent how to help and get results as we have done this for over 50 years. Join us and bless a child, it is about them, not so much you, right?